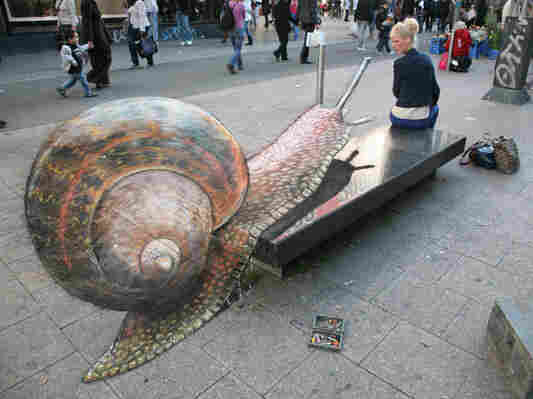 Woman On Street Attacked By Giant Snail, It Seems : Krulwich Wonders... 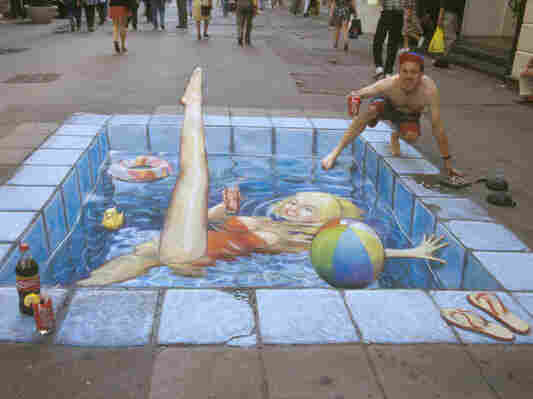 It looks like you could jump right into street artist Julian Beever's pool. But beware: You'd be in for a hard landing. 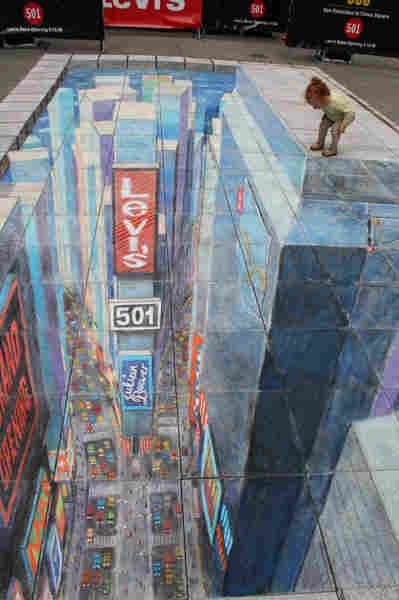 His work, just chalk on concrete, is a mastery of perspective. Here's what got Nagai Hideyuki excited. Hideyuki lives in Tokyo. He's now 21. This photo was taken on the other side of the world, somewhere in Europe. 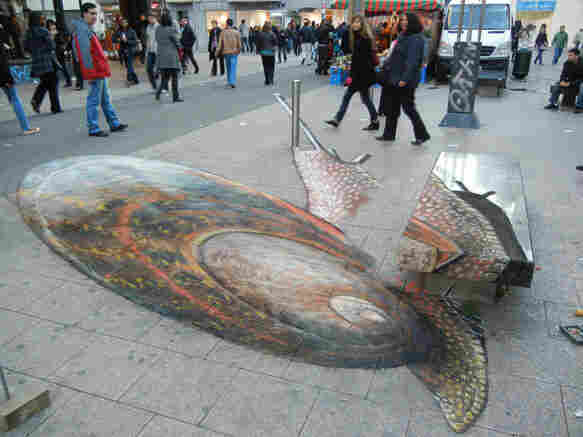 What you see here is a street and a plain stone bench, both partially covered by a chalk drawing. 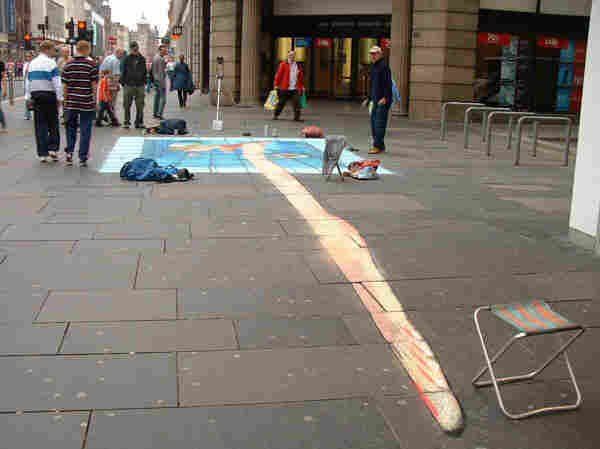 The drawing disappears in places and at one point seems to bump into a metal pole. It's uncanny. But it's all in the planning. Beever has a camera or a viewfinder posted at the very spot he wants his viewers to occupy, and he draws from that perspective. So here in Glasgow, Scotland, is a Marilyn Monroe-type bathing in what looks like a 3-D pool of real water. Notice the very real looking Coca-Cola bottle and can in the corner (you're supposed to notice, because Coke probably paid for this drawing) and ask yourself, are those real? They're not. Viewed from the "wrong" perspective, Marilyn's leg becomes a long, dangling tentacle and the soda pop goes, you should excuse the expression, flat. Beever can achieve dramatic, spectacular effects, with this technique. Here's a street ad he did on 44th Street in New York for Levi's. The little girl is real. When Nagai Hideyuki saw some of Beever's chalkings in the paper, he thought, "I've got to do that!" but he's not a street-artist type. "I realized it would be against the law," he writes on his website. Instead, he's taken Beever's work indoors, to the quiet of his desk, where he creates 3-D effects using two notepads and a bunch of pencils. That way, he doesn't have to deal with strangers, with cops or with weather. But the effect, if anything, is even more startling. This man thrusting his hand at us is, in actuality, a combination of two perfectly flat drawings (I kid you not), with a real eraser dropped onto his palm. 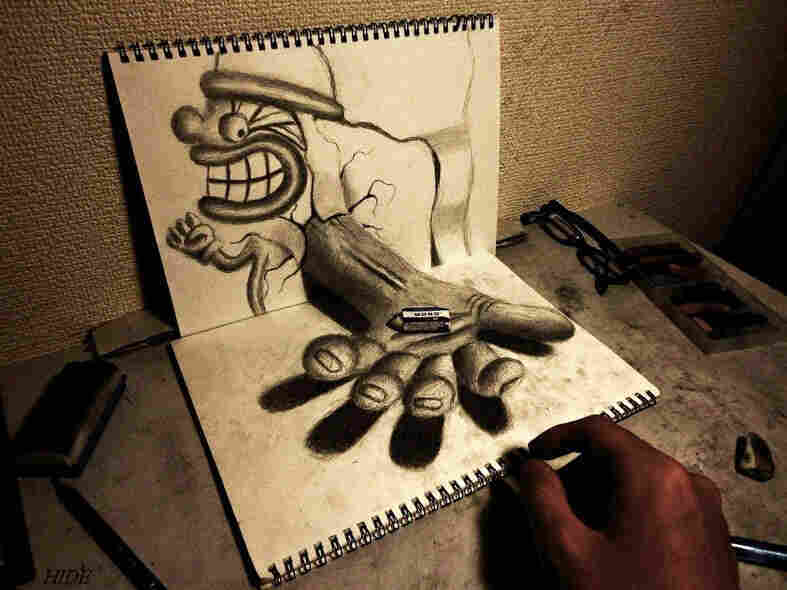 It's done the same way Beever (and a few other commercial artists like Kurt Wenner) do it: by drawing a precisely distorted image that the human brain, viewing from a precise angle, will see as a three-dimensional illusion. I imagine this is a trial-and-error procedure, but the result is so flawless, it's hard to believe this image is constructed from two flat planes. But then, at 27 seconds into the video, he separates the two pads, and for just a second or two, you can almost see the illusion. I love looking at things knowing they aren't there, but seeing them anyway. People used to take drugs to do this, but as Nagai Hideyuki would no doubt tell you, "That's [also] against the law." 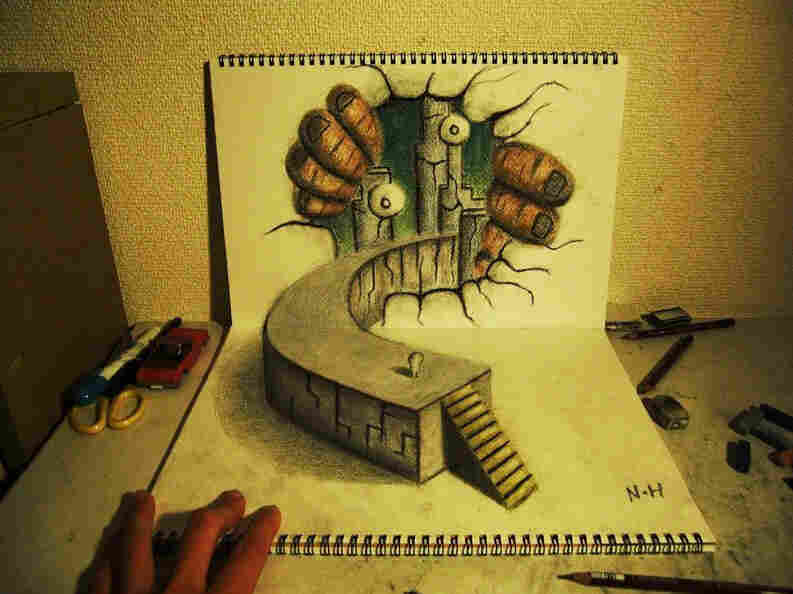 Three-D drawings are the perfectly legal alternative. Instead of popping a pill, you pop into a precise space, look down and gape. And no one can arrest you.